Questioning man's way to the Moon is almost an absolute taboo in scientific circles. But in the Internet, the debate between NASA defenders and Moon sceptics goes on, and public support for the latter grows. An official admission of a hoax would likely have the most grave consequences for NASA, the USA, and all people and organisations involved in space exploration worldwide. This would also challenge the future manned Moon and Mars missions. 4 Moon sceptics or "conspiracy theorists"? Moon sceptics say that NASA had to fake Apollo Moon landings due to severe technical problems, insoluble for these eight years, which deadline however had to be met by all means. The USA could not afford to lose the Moon race. Bill Kaysing (see below) suggested that "during the 1960s, they (NASA) said 'if you can't make it, fake it'". And in 2004, President George Bush gave not eight but sixteen years for a manned return to the Moon, albeit the technologies for it should have already been developed forty years ago. In 2010, President Barack Obama cancelled this plan, adding fuel to the fire of the Moon sceptics. Doubts about the authenticity of Apollo Moon landings appeared first in December 1968 when Apollo 8 was launched. 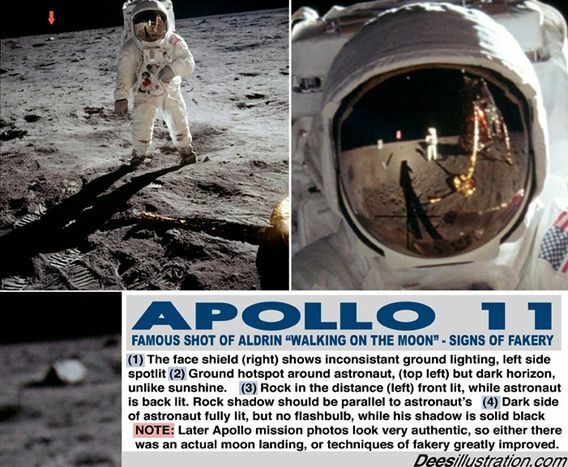 The almost perfectly executed odyssey of Apollo 11 seemed unreal to some who believed it to be a hoax, contrived for mere publicity. The first book on the subject ("Did man land on the Moon?") was issued in 1970 by the Texas mathematician James J. Cranny. (2:52–3:03) The suggestive scenes in the films "Diamonds are forever" by Guy Hamilton (1971) and especially "Capricorn One" by Peter Hyams (1978, about a hoaxed flight to Mars in a spacecraft that looks the same as the Apollo craft) gave a powerful boost to the popularity of the hoax theory, coinciding with the increased distrust in official US reports after the Watergate scandal. And today, a sequel to "Capricorn One" is in the "deep development stage", said Navid McIlhargey, Senior Vice President of New Regency Productions in Los Angeles. In 2006, the Apollo era slow-scan TV and telemetry data tape reels were declared missing. The question of what happened to the tapes "stuck in the craw" of the Moon doubters. And in 2009, NASA revealed that the tapes were erased. There are entire subcultures in the USA and substantial cultures around the world that are convinced that Apollo Moon landings were faked. This view is taught in Cuban schools and wherever else Cuban teachers are sent (Nicaragua, Angola, etc.). It is also shared by the Venezuelan President Hugo Chávez, the Taliban, and the International Society for Krishna Consciousness. On 14 June 1970, Knight Newspapers polled 1721 people in six US cities and found that more than 30% were "suspicious of NASA's trips to the Moon" with the number rising to 54% in some Afro-American areas.(pp. 3, 5) And on 4 November 2002, the Italian daily "Corriere della sera" reported that 68% of the non-white US population do not believe NASA. The following table lists a score of public opinion survey results. The "sceptics" column shows the percentage of people who doubt or deny that men walked on the Moon. † German astronaut Prof. Dr Ulrich Walter noted that the percentage of sceptics increased from 36% in 2002 to 44% just two years later. When Fox TV aired Bruce Nash's film "Conspiracy theory: Did we land on the Moon?" in 2001, NASA released hoax theory rebuttal materials on their web and FTP sites. They also wrote suggestions for science teachers on how to refute the hoax claims using the Lunar Sample Disk Kits. After NASA's decision to cancel the book, Oberg said that ignoring the problem just makes this harder and that he still intends to write it as an unofficial publication (working title: "A pall over Apollo"), depending on successfully arranging new funding sources. But as of 2009, no such book is known to have been published by him yet, albeit the influential Israeli daily Haaretz ("The Land") wrote that he did get the $15,000 from NASA. Moon sceptic Yuri Mukhin (see below) claims that Oberg had passed the text of the unreleased book for use by the voluntary NASA helpers.(p. 251) Oberg had indeed announced that he will issue the book in an informal manner. Nonetheless, with the advent of the Internet, unofficial websites appeared worldwide that aim to refute the sceptics' objections. Thus NASA's intention turned out to be carried out by others' hands, in an unofficial manner. So NASA evaded the initial promise and thus escaped responsibility, leaving the world public in a deep bewilderment. In 2009, NASA spokesman John Yembrick wrote that "amateurs are stepping in and arguing on behalf of astronauts and scientists who are too professional to defend themselves." Sri Lankabhimanya Sir Arthur Charles Clarke, Commander of the British Empire, Fellow of the Royal Astronomical Society, British science fiction author, inventor, and futurist. Sir Patrick Alfred Caldwell-Moore, Commander of the British Empire, Honorary Fellow of the Royal Society, Fellow of the Royal Astronomical Society, English amateur astronomer and writer. Prof. Dr Harald Lesch, German astrophysicist. Prof. Dr Michael Brant Shermer, American psychologist, economist, writer, founder of The Sceptics Society, and editor of its Sceptic magazine. Prof. Dr Steven I. Dutch, American geologist. Dr Gerardus D. Bouw, American astronomer, geocentrist, and "Geocentricity" site owner. Dr Igor Rurikovich Suslov, Russian physicist and doctor of physical-mathematical sciences. Dr James Randi (Randall James Hamilton Zwinge), American illusionist, founder of the James Randi Educational Foundation, and same-named site owner. Dr Michael Linden-Vørnle, Danish astrophysicist. Dr Mikhail Alexandrovich Nazarov, Russian doctor of geological-mineralogical sciences, director of the Laboratory of Meteoritics at the Vernadsky Institute of Geochemistry and Analytical Chemistry. Dr Pasquariello Domenico, director of the Italian Research Centre on Anomalous Phenomena (CEIFAN). Dr Philip Cary Plait, American astronomer, author of the book "Bad astronomy", and same-named site owner. Dr Steve D. Barrett, British physicist, Senior Lecturer, and Principal Scientist. Dr Vladislav-Veniamin Friedrichovich Pustynski, native-Russian-speaking Estonian astrophysicist, member of the International Astronomical Union, Spanish teacher, and "Man on the Moon" and "Apollo facts" site co-owner who defends NASA in Russian forums (alias "7-40" or "7:40"). Abduldaem Al-Kaheel, Syrian mechanical engineer, researcher in the Scientific Miracles of the Qur'an and Sunnah, author of forty books, and "Kaheel7" site owner. Alberto Farid Char Bonilla, Chilean psychologist, amateur astronomer, and "Austrinus" site owner. Alexander Yevgenyevich Markov, Russian engineer who collected a special library about the Apollo programme and Wernher von Braun and published a series of articles about them. Alexey Martov and Vadim Roshchin, Russian NASA defenders. Ali Murat Güven, Turkish journalist and columnist of the "Yeni safak" ("New dawn") conservative daily. Brent Silby, New Zealand learning advisor, teacher, philosopher, game designer, DJ, and "Def-Logic" site owner. Chan Kihung, Hong Kong Space Museum assistant curator. David A. Hardy, Fellow of the British Interplanetary Society and former President of the International Association of Astronomical Artists. David Dickinson, American aircraft armament systems specialist, amateur astronomer, and "Astro guyz" site owner. David John Owen, New Zealand psychiatric nurse, multi-instrumentalist, TV director, web designer, and same-named site owner. David Lyons, British "Astro Central" site owner. Diego Cuoghi, Italian architect, industrial designer, artist, art historian, writer, and same-named site owner. Dirk H. Lorenzen, German astrophysicist, writer, and member of the executive board of the German Association of Science Journalists. Gavin S. Sinclair, Scottish "Red Zero" site owner. Gleb Valentinovich Pyanykh (host) and Ella Boyko (author), the staff of the Russian NTV's "Maximum" programme. Guillermo O. Descalzo, Argentinian manager, rocket modeller, and same-named site owner. HJP Arnold, Fellow of the Royal Astronomical Society, the British Interplanetary Society, and the Remote Sensing and Photogrammetric Society. Ian Williams Goddard, American freelance artist, writer, and same-named site owner. James Franklin Hyneman, Adam Whitney Savage, Grant Masaru Imahara (special effect experts), Salvatore Paul Belleci (filmmaker), and Kari Elizabeth Byron (artist), American staff of the Australian TV programme "Mythbusters" (also aired on the Russian TV3 channel). James V. Scotti, American astronomer and Senior Research Specialist. Jay Windley (alias Jay Utah), American engineer and "Clavius" site owner. Keith Mayes, British amateur astronomer, author of the book "Science, the Universe, and God" (2004), and "Keyboard" site owner. Marcus Haas, German physicist and same-named site owner. Masashi Yokoyama, Hiroshi Yamamoto, Junya Terazono, and Tatsuya Honjo, Japanese NASA defenders of the Association for Sceptical Investigation of Supernatural (ASIOS). Matteo Negri, secretary of the Italian amateur astronomers group "Columbia" and owner of the "Siamo andati sulla Luna" ("We went to the Moon") site. Matthias Lipinski, German "Apollo Projekt" site owner. Milivoje Jugin, Serbian aeronautics engineer. Neil Atkinson, English geologist and "Apollo Hoax" site owner. Paolo Attivissimo, Swiss writer, journalist, and same-named site owner. Patrick Jacques, President of a Belgian astronomy club. Philip R. Karn, Jr, American electrical engineer, radio amateur, programmer, and "KA9Q" site owner. Piero Bianucci, Italian journalist and writer. Robert A. Braeunig, American engineer, amateur astronomer, and same-named site owner. Ronaldo Rogério de Freitas Mourão, Brazilian astronomer. Svetoslav Dimitrov Alexandrov, Bulgarian "Cosmos" site owner. Thanassis Vembos, Greek researcher, journalist, writer, and same-named site owner. Thomas Bohn, Canadian "Moonshot" site owner. Tom Callen, Swedish astronomer and programme producer at Cosmonova, the Swedish Museum of Natural History. Tracy Ballinger, Angeline Lim, Katie Sprouse, Ronen Kalay, and Ben Goecke, American attendants in the Space Science Outreach and Research (SSOAR) academy. Uwe Rexin, German "Mondlandung" site owner. Visanu Euarchukiati, Thai Astronomical Society deputy secretary. Vladimir Nikolaevich Pavlyuk, Russian aviation equipment engineer who defends NASA in web forums (alias Stary—old man). Yuri Donatovich Krasilnikov (physicist and programmer) and Vyacheslav Yatskin (programmer), Russian NASA defenders, authors of the 327 KB long Moon Hoax article at "Skeptik.net". Christopher W. Powers, American software engineer who wrote a Usenet article in 1995 on filmmaker Stanley Kubrick directing the Moon hoax and admitted that it was a joke twelve years later. William Karel, French filmmaker who directed the mockumentary "Opération Lune" (2002; English version: "Dark side of the Moon") further developing the above joke about Kubrick. Wikipedia editors do their best to defend NASA, categorising the Moon hoax view as "conspiracy theory", "pseudo-science", "pseudo-history", "denialism", etc. Moon sceptics or "conspiracy theorists"? Psychologist Floyd Rudmin writes that "conspiracy theory" is a powerful pejorative label, meaning paranoid, nutty, marginal, and certainly untrue. Its power is that it discounts a theory by attacking the motivations and mental competence of its advocates. By labelling an explanation of events "conspiracy theory", evidence and argument are dismissed because they come from a mentally or morally deficient personality, not because they have been shown to be incorrect. Calling an explanation of events "conspiracy theory" means, in effect, "We don't like you, and no one should listen to your explanation." In past eras, other pejorative labels like "heresy", "witchery", and "communism" also worked like this. The charge of "conspiracy theory" is not so severe, but in its way much worse. Heresy, witchcraft, and communism at least retain a sense of potency, designating ideas to be feared. "Conspiracy theory" implies that the ideas and their advocates are simple-minded or insane. Such labels implicitly define a community of orthodox believers and try to banish or shun people who challenge orthodox beliefs. Community members sympathetic to new thoughts may shy away from them and join in the shunning in fear of being tainted by the pejorative label. Conversely, NASA defenders are called "NASA hiwis" and "Pro-Apollo nutters" ("PANs") by Moon sceptics Yuri Mukhin(p. 251) and Sam Colby, respectively (see below). The 4 theses of "Stary"
The 4 theses of "Gosh"
The refuters are unable to find in the universally accepted theory a single discrepancy that would permit a suspicion in falsification. The refuters do not understand anything in what they try to judge. The refuters are unable to make both ends meet even in the very grounds of their own theories. The refuters are forced to lie and fake, although they accuse their opponents and NASA in this all the time. The flyers' position is based on an absolute, religious faith in the Americans' landing, because they have no evidence and they are unable to stand up for their beliefs with facts and numbers. The flyers, being profanes in the subject themselves, have terrible complexes because of that, and try with all their might to shift the argument about the landing into a discussion about the opponents' personalities, thus trying to self-assert. In the course of the argument, they so much lie, cheat and dodge, and to hide all this—they first attack their opponents with accusations in cheating and faking, "finding" them even where they cannot be in principle. In the bottom line, the flyers cannot refute a single evidence of the affair produced by the conspirologists without speculations, faking and going into personalities. Some of the most notable Moon sceptics are listed below. Kaysing stated that the chance of a successful Moon landing was calculated to be 0.0017% in a late 1950s Rocketdyne report, and that the F-1 rocket engine had combustion stability problems.(p. 9) He said that the Saturn V rockets took off without astronauts on board, suggesting a "coalition between governments at the highest level" to conceal, among other things, the Moon hoax. Sibrel says that "a successful manned mission to the Moon offered a wonderful, pride-boosting distraction for the near revolt of the citizens of America over 50,000 deaths in the Vietnam War", with lunar activities stopping abruptly and planned missions cancelled around the same time that the USA ceased its involvement in Vietnam. In his film "Astronauts gone wild" (see above), Sibrel asked nine Apollo astronauts to swear on the Bible that they went to the Moon. Three of them did. Apollo 11 lunar module pilot Buzz Aldrin did not. Sibrel called him "a coward and a liar and a thief" but got a punch in the face. Dr Stanislav Georgievich Pokrovsky (b. 1959) is a Russian candidate of technical sciences and General Director of the scientific-manufacturing enterprise "Project-D-MSK". In 2007, he studied the filmed staging of the first stage (S-IC) of the Saturn V rocket after the launch of Apollo 11. Analysing it frame by frame, he calculated the actual speed of the Saturn V rocket at S-IC staging time using four different, independent and mutually verifying methods. With all of them, the calculated speed turned out to be at maximum half (1.2 km/s) of the declared one at that point (2.4 km/s). He concluded that due to this, no more than 28 t could be brought on the way to the Moon, including the spacecraft, instead of the 46 t declared by NASA, and so a loop around the Moon was possible but not a manned landing on the Moon with return to the Earth. In 2008, Pokrovsky also claimed to have determined the reason why a higher speed was impossible—problems with the Inconel X-750 superalloy used for the tubes of the wall of the thrust chamber of the F-1 engine, whose physics of high-temperature strength was not yet studied at that time. The strength of the material changes when affected by high temperature and plastic deformations. As a result, the F-1 engine thrust had to be lowered by at least 20%. With these assumptions, he calculated that the real speed would be the same as he had already estimated (see above). Pokrovsky proved that six or more F-1 engines (instead of five) could not be used due to the increased fuel mass required by each new engine, which in turn would require more engines, and so on. Pokrovsky claims that his Saturn V speed estimation is the "first direct proof of the impossibility of the Apollo Moon landing". He says that fifteen specialists with scientific degrees (e.g. Alexander Budnik) who reviewed his paper, of which at least five aerodynamics experts and three narrow specialists in ultrasonic movement and aerosols, raised no objections in principle, and the specific wishes and notes they (e.g. Vladimir Surdin) did have could not change his results significantly even if followed. Pokrovsky compares his own frame-by-frame analysis of the filmed Saturn V flight to the frame-by-frame analysis of the filmed Trinity nuclear test (1945) done by the Soviet academician Leonid Sedov who created his own blast wave theory to estimate the then top secret power of the explosion. See also author's note below. Pokrovsky's findings about the rocket speed were later confirmed by Alexander Reshnyak and Alexander Popov (see below) and his smoke lag method proven to be valid. Dr Alexander Ivanovich Popov (b. 1943) is a Russian senior research associate, doctor of physical-mathematical sciences, and author of more than 100 scientific works and inventions in the fields of laser optics and spectroscopy. Visual (photo, film and video) material that can successfully be made on Earth, in cinema studios. Obvious counterfeits and fakes, when visual material from ordinary space flights on Earth orbit is presented as Moon material. Space photos, attributed to the astronauts but which by that time could already be made and were made by space robots, including American ones. Devices on Moon (e.g., light reflectors)—by that time both American and Soviet automatic "messengers" had sent on Moon several tens of similar devices. Unfounded, unprovable claims, e.g., for about 400 kg of soil, overwhelming part of which NASA keeps safe and gives only grams for checking. Thus he concluded that the NASA claims on Moon landings are left unproven, and pursuant to science rules, in the absence of trustworthy evidence, the event, in this case the American Moon landings and their loops around the Moon, cannot be considered real, that is, having taken place. He also confirmed Pokrovsky's results for the speed of the Saturn V at S-IC staging time (see above). Popov accused the Politburo of the CPSU Central Committee of trading the 1970s Détente for covering up the US Moon hoax and stopping the Soviet Moon programme. H.E. Dr Hugo Chávez Frías (b. 1954), the President of the Bolivarian Republic of Venezuela. Prof. Dr Krassimir Ivanov Ivandjiiski (b. 1947), Bulgarian doctor of economics and professor in geopolitics and international relations. He is the editor of the monthly analytical newspaper "Strogo sekretno" ("Top secret"), which published a series of ten articles on the Moon Hoax, based on the ideas of Alexander Popov (see above) and Arkady Velyurov (see below) in 2007–2008 and started a new series in 2010. Prof. Dr Li Zifeng, Chinese geologist, member of the Society of Petroleum Engineers and the Petroleum Society of Canada. Prof. Dr Takahiko Soejima (b. 1953), Japanese political scientist and writer, member of the International Political Science Association, founder and president of the Soejima National Strategy Institute, and author of the book "1962–1972: Apollo 11 has never been to the Moon" (2004). Prof. Federico Martín Maglio (b. 1959), Argentinian higher educator and "FMM education" site owner. Prof. James M. McCanney, American physicist, lecturer, writer, radio show host, and "J. McCanney science" site owner. Prof. Luke Sargent, American historian, professional violinist, and "Fake Apollo" site owner. Dr Marco Stefanelli, Italian PhD in Indovedic psychology, analyst-programmer, Web engineer, painter, Reiki Usui alternative medicine practitioner, researcher, audio engineer, sound designer, composer, multi-instrumentalist, and same-named site owner. Dr Neville Thomas Jones, British physicist and "Reality reviewed" site owner. Dr Sergey Andreevich Alexeenko, Russian inventor, candidate of physical-mathematical sciences, Honorary builder of the Baikonur and Plesetsk space launch facilities, member of the Federation of Cosmonautics of Russia, and nuclear weapon test participant. Dr Shrikant N. Devdikar, Indian medical doctor and "Shriworld" site owner. Dr William L. Brian II, American engineer and writer. He says that "the film speed was adjusted to slow down the action to give the impression that the astronauts were lighter than they actually were". Abhay Charanaravinda Bhaktivedanta Swami Prabhupāda (1896–1977), the founder of the International Society for Krishna Consciousness. Alexander Garrievich Gordon (b. 1964), Russian radio and TV host, journalist, actor, and filmmaker. Author of the film "The Americans haven't been on the Moon" (1997). Alexander Valeryevich Reshnyak (b. 1973), Russian engineer who confirmed Pokrovsky's results on the Saturn V speed (see above) using a method of his own. André F. Mauro (b. 1964), Brazilian filmmaker and writer, author of the book "O homem não pisou na Lua" ("Man did not set foot on the Moon"), and "Show da Lua" site owner. Anne Tonelson (d. 2006), British stage actress who lived in Nashville and narrated the documentary film "A Funny Thing Happened on the Way to the Moon" by Bart Sibrel (see above). Anup Raj Shrestha, Nepalese software developer and "Big Mantra" site owner. Arkady Velyurov, Russian "Pepelatsy" site owner. Aron Ranen, American filmmaker. His documentary film "Did we go?" (co-produced with Benjamin Britton) was selected for the 2000 "New Documentary Series" Museum of Modern Art, New York City, the 2000 Dallas Video Festival Awards, and the 2001 Digital Video Underground Festival in San Francisco. He received a Golden Cine Eagle and two fellowships from the National Endowment for Arts. Borislav Lazarov, Bulgarian radio host, journalist and author of the documentary film "To the Moon and back" (2007). Bruce Mitchell Nash (b. 1947), American writer and reality TV producer. Charles T. Hawkins (b. 1962), American writer whose book "How America faked the Moon landings" (2004) presents the ideas of Sam Colby (see below). Clyde Lewis (Louis Clyde Holder, born 1964), American radio talk show host. David Cosnette, British "Cosmic Conspiracies" site owner. David McGowan (b. 1960), American writer, contractor-constructor, and "Centre for an Informed America" ("CIA") site owner. David P. Wozney, Canadian tax specialist. David R. Hook (1971–2006), Canadian comedian, musician, and author of "The Moon song". David S. Percy, British TV producer, audio-visual technology expert, member of the Royal Photographic Society, coauthor (with Mary Bennett—see below) of the book "Dark Moon" (2001), and director of the documentary film "What happened on the Moon?" (2000). He says that NASA photos have so obvious flaws that they prove that insiders tried to "blow the whistle" on the hoax by purposely adding errors they know will be seen. Eric Hufschmid, American software engineer and same-named site owner. Gerhard Wisnewski (b. 1959), German publicist and author of the films "Die Akte Apollo" ("The case Apollo", 2002) and "Die Mond(f)lüge: Warum Menschen niemals auf dem Mond landeten?" ("Why have men never landed on the Moon? ", 2008), and the books "Lies in space" (in German) and its English version—"One small step?". Gernot L. Geise, German writer, author of "Der größte Betrug des Jahrhunderts? Die Apollo-Mondflüge" ("The greatest scam of the century? The Apollo Moon flights") and five other books on the subject. Henry Kubik, Polish-Australian electronic music composer, lyricist, performer, sound engineer, and producer. Ivona Živković, Serbian journalist and TV star. Jack White, American photo historian, photo analyst, and expert on the assassination of US President John Kennedy. Jackie Jura, independent Canadian researcher and "Orwell Today" site owner. James Beals, American "Future Sun" site owner. James M. Collier (d. 1998), American journalist, writer, and author of the film "Was it only a paper Moon?" in 1997, in which he examines some mechanical issues of the Apollo Lunar Module, questioning its usability. Jarrah White, native Australian, author of the film series "MoonFaker". Jean-Luc Godard (b. 1930), French-Swiss filmmaker. Jiří Wojnar, Czech writer, journalist, and editor of the "WM" magazine who published a Czech translation of Sam Colby's work (see below) in 2004. Joe Rogan (b. 1967), American comedian, actor, and summariser. John Lee, American "NASA moons USA" site owner whose film "We Never Went to the Moon" received the "Music Video of the Year" award in 2005. Kazimierz Ożóg, Polish "Market analysis" site owner. Kenneth Lee Vardon (b. 1939), American Navy veteran, radioman, cryptographer, businessman, consultant, and founder of the American Patriot Friends Network. Kevin Overstreet, American "Bates Motel" site owner. László Aranyi, Hungarian same-named site owner and translator of Sam Colby's pages (see below). Lauri Leinonen, Finnish sheep farmer, web designer, and "Lampuri" site owner. Leonid Valentinovich Batsura, Russian "Himmash" design house lead engineer and rocket engine specialist. Marcus Allen, British photographer, image analyst, and publisher of Nexus magazine who said that Lunar Module photos do not prove that the US put men on the Moon: "Getting to the Moon really isn't much of a problem—the Russians did that in 1959—the big problem is getting people there". Mario Kienappel, German "Esoturio" site owner. Marwa Rizk, Egyptian journalist and columnist of the "Moheet" on-line daily. Mary D. M. Bennett, British researcher and writer who coauthored David Percy's book "Dark Moon" and attended his documentary film "What happened on the Moon?" (see above). Michael Palomino, Swiss musician, writer, and "Geschichte in Chronologie" ("History in chronology") site owner. Pasi Toivonen (b. 1970), Finnish "Cutting edge Finland" site owner. Peter Bown, English senior school physics teacher and part time photographer. Philippe Lheureux, French author of the books "Moon Landings: Did NASA lie?" and "Lumières sur la Lune" ("Lights on the Moon"), and same-named site owner. Ralph René (1933–2008), American inventor, self-taught engineering enthusiast, and author of the book "NASA mooned America" (1994). Randy Reid, American coauthor of Bill Kaysing's book "We never went to the Moon" (see above). Ronnie Stonge, British narrator of David Percy's documentary film "What happened on the Moon?" (see above). Sam Colby, British "NASA Scam" site owner which, among the other things, provides information and photos of the site and the equipment said to be used for the hoax. Satsvarūpa dāsa Goswāmī (b. 1939), Indian writer, poet, artist, and guru of the International Society for Krishna Consciousness. Victor Pavlovich Friedman (b. 1970), Russian writer who lived in the USA (1991–2002) and translated René's book (see above) to Russian. Whoopi Goldberg (Caryn Elaine Johnson, born 1955), American actress, comedian, singer-songwriter, activist, and media personality. Prof. Dr Wernher Magnus Maximilian Freiherr von Braun (1912–1977), claimed by Bart Sibrel, Ralph René,(pp. 16, 54), Aron Ranen(part 5, 6:14–7:21) and Stanislav Pokrovsky, and Prof. Dr John Owen Annexstad, claimed by Stanislav Pokrovsky to be complicit in the hoax by collecting lunar meteorites to be used as the basis for "Moon rocks" during their expeditions to Antarctica in 1967. Colonel Frank Frederick Borman, II (b. 1928), Gemini 7 and Apollo 8 flight commander. He visited the USSR just before the Apollo 11 flight (as Alexander Popov says, to reconnoitre whether the Russians believed in the Apollo 8 orbiting the Moon and help decide if they can "swallow" a much larger Apollo 11 Moon landing hoax). He was also one of the Skylab programme managers. Donald Kent Slayton (1924–1993), NASA Chief Astronaut in 1968, claimed by Sam Colby to be one of the main hoax perpetrators. Michael J. Tuttle, Simithsonian Institution webmaster, claimed by Sam Colby to have made fake photos in the mid-1990s and to have admitted that. Colby says that 95% of the NASA Moon photos were never seen before the spread of the Internet. Walter Leland Cronkite, Jr (1916–2009), CBS journalist who Bill Kaysing says "was the father figure that NASA chose to essentially hype the whole project". William M. Thompson (1920–2002) who had written the following: "I was actually part of the team that created the faked Moon landings and I am ready to talk about them. I have physical evidence to prove that they were faked", to Sam Colby and Kenneth Vardon. The Lookout Mountain Laboratory, claimed by David McGowan to have done the post-production on the Apollo footage after the official "deactivation" of the studio in 1969. Some specific issues are listed below. The burden of proof is on those who make such claims without any credible evidence to support them (i.e. those who deny the Apollo Moon landings). The authenticity of a scientific discovery (manned flights to the Moon) should be proven by its author (the USA) and those who share its point of view (the defenders). Too many people were involved with the project to keep a secret like this. More than 400,000 people worked on the Apollo project for nearly ten years, and a dozen men who walked on the Moon returned to Earth to recount their experiences. It would have been significantly easier to actually land on the Moon than to generate such a massive conspiracy to fake such a landing. Even if the Russians did suspect the landings were not authentic, the act of calling the USA liars of this magnitude at the height of the Cold War could have instigated a war, and perhaps they thought it better not to chance that. Russia could have blabbed to the world that the Moon landings were fake, and probably would have done were Khrushchev in power, but the West would say they were jealous because the USA had beaten them to it. Since 1967, the Politburo of the CPSU Central Committee has helped the USA while impeding the Soviet Moon programme by all means. The Proton rocket failure in September 1967 was a result of a diversion.(p. 172) The N-1 rocket failure in June 1969 was a result of in internal engine explosion caused by a foreign metallic object. In 1970, the USSR and the USA secretly agreed to hide from the public some circumstances of the latter's Moon programme. In 1974, the Politburo ordered the destruction of 3 ready-to-fly N-1 rockets. (The USA and Japan's NASDA bought and licensed their NK-33 engines a couple of decades later, and NASA will use them, marketed by GenCorp Aerojet as AJ26, in the Orbital Sciences Taurus II expendable launch system.) Since 1976, no Soviet space robot has flown to the Moon—the Politburo stopped their flights to prevent an Apollo hoax disclosure. And the 1980s Politburo led the USSR to a break-up. As a result, the Russian leadership cancelled the Energia rocket in 1993. All these actions were in favour of the USA. On the death of Virgil Grissom, Edward White, and Roger Chaffee (in the Apollo 1 fire), Edward Givens (on a car crash), Clifton Williams (on a T-38 jet trainer), Michael Adams (on an X-15 high-altitude experimental aircraft), Robert Lawrence (on an F-104B combat trainer), Russel Rogers (on an F-105 fighter), and Thomas Baron with all his family (at a railroad crossing) in 1967, the NASA defenders asked: Why remove the disagreeable along with the unique experimental aircraft or the first spacecraft prototype? 3 of the X-15 were built, and its last flight was a year later (in 1968), out of 9 service years in total. Apollo 1 was not the first prototype but had a serial number of 012.. For many years before and after 1967 both the US and Soviet space industry had from 0 to 3 death cases per year. Only in 1967, a year before the first manned Apollo flight, there were 11 death cases. Lunar explorers should be able to jump vertical distances up to 12 or 14 ft (4 ± 0.3 m) on the Moon, unencumbered with a spacesuit or other equipment, but will experience difficulty in maintaining their balance. However, falls from these heights under similar conditions are not likely to result in personal injury. The EMU (Extravehicular Mobility Unit, or the Apollo spacesuit) tested on Apollo 9 and used on Apollo 11–14 weighs about 85 kg fully charged. Assuming astronaut's body weight of 85 kg, his total weight including the space suit would be 170 kg, so he could achieve jump heights of 2 m. But the maximum jump height shown by an Apollo astronaut was 0.42 m, which is five times less. Between 1969 and 1972, six Apollo missions brought back 382 kg of lunar rocks, core samples, pebbles, sand and dust from the lunar surface. Lunar samples are prepared for shipment to scientists and educators at NASA's Lunar Sample Laboratory Facility. Nearly 400 samples are distributed each year for research and teaching projects. All samples (split or intact) must be returned to the NASA Johnson Space Centre after being studied. There are plenty of museums, including the Smithsonian and others, where members of the public can touch and examine rocks from the Moon. In the 1990s, publications about lunar soil simulation started to appear. They could not have appeared earlier as this would raise questions about the Apollo programme. Carlton Allen, Astromaterials Curator Manager: "We in the Astromaterials Acquisition and Curation Office continue our core missions providing samples of extraterrestrial material to the international science and education communities and curating these unique samples for future generations." Poor contemporary scientists. With their instruments, they can register every single atom in a substance, but they were denied trust. Poor future generations of scientists. In the 21st, and possibly in the 22nd century, they will of course lack such splendid crafts and rockets as "Apollos" and Saturn-Vs were in the 20th century. They will not be able to fly up the Moon and get fresh lunar stones. But NASA took care of them: it did not give the lunar stones to its contemporaries, and set them aside for them. Who first brought Moon soil to Earth? 16 July 1969: Apollo 11: First lunar soil and rock samples returned to Earth. First lunar soil was brought to Earth by the Soviet space robots Luna 16 (1970), Luna 20 (1972), and Luna 24 (1976). On 21 July 1969, Armstrong and Aldrin left lunar laser ranging reflectors on the Moon surface. They reflect pulses of laser light fired from the Earth, helping measure its distance to the Moon with high accuracy. Apollo 14 and 15 also left each one such reflector. The Apollo 11, 14 and 15 reflectors were left on the Moon by secret Surveyor 8, 9, and 10 unmanned probes that were not really cancelled as declared. 20% of mankind at the time watched Neil Armstrong's first steps on the Moon. Three tracking stations were receiving these signals from the Moon simultaneously. They were CSIRO's Parkes Radio Telescope, the Honeysuckle Creek tracking station outside Canberra, and NASA's Goldstone station in California. They received the voice communication with and between the astronauts, and spacecraft and biomedical telemetry radio signals from the Moon too. The TV and radio signals were emitted from Earth to the Moon and re-translated to Earth by the radio equipment of special secret Surveyor or Orbiter unmanned crafts.(pp. 196, 197) (27 of 61 US space rocket launches in 1968 were secret, and 20 of 47 in 1969). Unable to track Apollo flights due to incompatibility issues, in 1968 the USSR built in Simferopol (Crimea) a dedicated tracking facility with a S-band (13 cm) antenna with a diameter of 32 m. To track the spacecraft on their lunar orbits, their data was needed. As it was not published, it was calculated based on the start and Moon arrival times of the Apollo crafts reported on US radio. Apollo 8, 10, 11 and 12 from December 1968 to November 1969 were tracked, including voice communications of the astronauts with Earth, TV images, and telemetry data. This was the only Soviet tracking facility. The fact that orbit data was calculated based on the start and Moon arrival times of the Apollo crafts reported on US radio means that the USSR did not fix the fact of "Apollos" leaving Earth orbit for the Moon nor did it track their movement on the spaceway Eath—Moon. Because if they fixed and tracked, then no orbit calculation or using US radio reports about the start and Moon arrival times would be needed. Thus the fact of "Apollos" leaving Earth orbit and the entire flight from the Earth to the Moon were left totally unconfirmed by Soviet means. Nor did the USSR track this in a telescope, as reported from the only Soviet facility capable of that—the Sternberg Astronomical Institute in Moscow. Not every waving flag needs a breeze—at least not in space. When astronauts were planting the flagpole they rotated it back and forth to better penetrate the lunar soil (anyone who's set a blunt tent-post will know how this works). So of course the flag waved! Unfurling a piece of rolled-up cloth with stored angular momentum will naturally result in waves and ripples—no breeze required! Michael Collins used this map to mark the estimated [Apollo 11] Lunar Module locations given to him by Houston. "Moon" surfaces like this have artificially been prepared on the Earth (Flagstaff, Arizona) in the 1960s, as Dr Farook El Baz explained in the BBC film "Moon" (see also ). At 17:00 in that film, an experienced hand of a master superimposes a slight veil on a photo of this artificial surface to get a cosmic look. A set of recent still images was published by NASA on July 17, 2009. Taken by the Lunar Reconnaissance Orbiter (LRO) mission, these images show lunar landers, including that of Apollo 11, standing on the surface, science experiments, and, in one case, astronaut footprints in a line between the Apollo 14 lander and a nearby science experiment. A month after LROC's first image of the Apollo 11 landing site was acquired, the LRO passed over again providing the [LRO Camera] (LROC) instrument a new view of the historic site. Photos showing those objects can be made on a printed lunar surface photos with rough models of the objects added, or using a computer. Anyone with a bit of common sense should realize that NASA could have Photoshopped these landing site photos much more easily than taking them from an orbiting probe. What is the rotating object flying past the lunar module at 21:00? "Flight" over a Moon globe? [Stuart Roosa] It's 2001 type stuff. That old moors just growing magnificently fast, and it's just filling up that hatch window... and you're drifting into the shadow. 04 06 54 42 LMP ([Apollo 10] Lunar Module Pilot) [Eugene Cernan] "OK baby." 04 06 54 47 CDR (Commander) [Thomas Stafford] "2, OK, 12, 10"
04 06 54 53 LMP "8, 7, 6, 5, 4, 3, 2, 1"
04 06 55 O1 LMP "Burn." 04 06 55 02 CDR "OK. OK, it's burning down." The ring-shaped structure gets dark in 11 seconds, but the terminator (the border between the light and darkness) on the Moon moves only 70 m for such a short time, whereas the distance to the horizon for an orbit height of about 110 km is about 600 km. 70 m vs 600 km is a too great discrepancy. And why it suddenly gets lit up shortly after that? All this is explainable if we assume that NASA used their huge Moon globes for filming. Prevention of destruction or of reconnaissance? 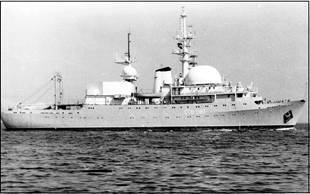 On 16 July 1969, from 8:00 to 9:00 EST (Apollo 11 was launched at 8:32), near the Cape Canaveral Space Centre, 7 Soviet trawlers with reconnaissance equipment on board were met by 15 US surface ships, 7 submarines and an unspecified number of P-3 Orion-type maritime patrol and reconnaissance aircraft with electronic warfare equipment on board, of US Second Fleet. 12 minutes before the Apollo 11 launch, all US coastal, ship and aircraft radio jamming equipment was switched on full power and then switched off 4 minutes after Apollo 11 reached Earth orbit. The operation was justified by an alleged danger that the Soviet ships can try to radio-jam the Saturn V electronic equipment and thus destroy the flight. The danger was later recognised as non-existent, and the $320 million spent on the operation as wasted. To destroy the rocket would be suicidal for the Soviets as it would equal to declaring a nuclear war. The real reason why the Soviet reconnaissance was suppressed was to not let it receive the Saturn V telemetry data, which would reveal the non-conformance of its real speed and altitude to the declared values and that the flight does not proceed as declared. Astronomer Richard West of the European Southern Observatory (ESO) who commented the Apollo 11 Moon landing at the Danish TV says that they had a manual of 1000 pages or so where it was exactly described what the astronauts had to do at what time (in  at 9:21). How can it be relied that everything would go in accordance with the 1000-page instruction manual, when every detail was done for the first time? But if it was a play, then an instruction (or scenario) is absolutely necessary. If the actors don't strictly follow the instructions of the director, the show will inevitably fail. Famous shot of Aldrin "walking on the Moon"
Astronaut Buzz Aldrin, [Apollo 11] lunar module pilot, walks on the surface of the Moon near the leg of the Lunar Module (LM) "Eagle" during the Apollo 11 extravehicular activity (EVA). Astronaut Neil Armstrong, commander, took this photograph with a 70 mm lunar surface camera. The face shield (right) shows inconsistent ground lighting, left side spot lit. Ground hotspot around astronaut (top left) but dark horizon, unlike sunshine. Rock in the distance (left) front lit, while astronaut is back lit. Rock shadow should be parallel to astronaut's. Dark side of astronaut fully lit, but no flashbulb, while his shadow is solid black. As [Apollo 11] astronauts in special isolation suits watched, frogman scrubbed the capsule down with disinfectant. (right photo) Apollo crew waved as they entered quarantine trainer aboard Hornet. The astronauts then settled down for an 18-day quarantine to make certain their contact with the Moon had not contaminated or infected them in any way. What bacteria can there be on the Moon, tilled already for several billions of years every 27 days now by space cold of −150°C, now by Sun heat of +150°C, and irradiated by streams of radiation from the Sun flares? Do Earth medics have such sterilisers? And why scrub the craft down with disinfectant if it had flown through the atmosphere in a cloud with a temperature of several thousands of degrees on its return? And, if lunar bacteria do exist and are so hardy, then what quatantine, and what disinfectant can help against them? But if there was a hoax, the quarantine was important for its success. The black [gas] masks on the astronauts' faces helped them avoid unwanted sights by the welcoming people (and questions from the press during the whole quarantine) while getting used to their most important role (Moon flight stories), having ensured three weeks later that the world public opinion had already believed Apollo Moon landings. It did, so next Apollo crews had no quarantine. The [Apollo 12] colour television camera provided satisfactory television coverage for approximately 40 minutes at the beginning of the first extravehicular activity. Thereafter, the video display showed only white in an irregular pattern in the upper part of the picture and black in the remainder. The camera was turned off after repeated attempts by the crew to restore a satisfactory picture. In the process of moving the camera on the lunar surface, a portion of the target in the secondary-electron conductivity vidicon must have received a high solar input, either directly from the Sun or from some highly reflective surface. That portion of the target was destroyed, as was evidenced by the white appearance of the upper part of the picture. This view of the damaged Apollo 13 Service Module (SM) was photographed from the Lunar Module/Command Module following SM jettisoning. The rear side of a spotlight is clearly seen on the top right edge of the photo. When brightness and contrast are increased, a halo due to reflection of its light by dust is seen. So the photo was made in a studio. In early 1970, the Soviet Union recovered an empty Apollo capsule and returned it to the US several months later. The capsule was identified at NASA as the BP-1227 training capsule lost a while back. It was on the night of 11–12 April 1970, the night after Apollo 13 was launched, and it was its capsule and not BP-1227. Edgar Mitchell (Apollo 14): "Our next major problem was the well-known one of the solder ball in the abort switch, which happened just two hours before we were scheduled to go down to the lunar surface, and we noticed as we were on our last circuit of the Moon before starting down, while checking out the lunar module and getting ready, that the abort light came on in the lunar module. And that was a surprise. It shouldn't do that." More than a half of the frames in the NASA (.mpg) film are repeated, and after removing them, the acceleration it was taken under was calculated as 9.5 ± 2 m/s². The experiment may have been filmed at NASA's Space Power Facility (SPF) vacuum chamber. Also, the same experiment was conducted in a London studio without a vacuum chamber and with the same results in the film "What happened on the Moon?". A view of the Apollo 15 Command and Service Module from the Lunar Module. If it were an actual three-dimensional scene, the spaceship would be 69 miles above the lunar surface—which would, I would think, make it difficult for a portion of that lunar terrain to obscure part of the ship's S-band antennæ assembly. Shrink-wrapped photo on Moon surface? Charlie [Duke, Apollo 16] put a picture of the Duke family—Charlie, Dotty, and sons Charles and Tom—on the surface and took several pictures of it. This image is the best of the series. 177:38:58 [Thomas] Mattingly (Apollo 16): "OK, about 5 feet." 177:40:37 Mattingly: "Doesn't look like it. I don't have any barber poles (stripped indicators' output; means it's all OK). There we go. Took a couple of extra blurps to get you. OK. Are you free?" 177:41:00 Mattingly: "OK, it looks - looks pretty fair. How about if I just retract you?" 177:41:25 Mattingly: "I believe we're there." 177:41:27 Mattingly: "Casper's captured Orion!" No control thruster activity is visible (contrast this with the photo of the Apollo taken from the Soyuz). Attitude changes made by the lunar module while manoeuvring in lunar orbit look remarkably like a model is being manipulated in front of a lunar backdrop. Calculating from the coordinates of the Apollo 17 lunar landing site (20.16° North and 30.77° East), the Earth should be at constant 53.4° above the lunar horizon. 188:01:27 [Apollo 17] lunar lift-off film. The television camera was mounted on the rover which Gene [Cernan] parked about 145 m east of (behind) the lunar module. The ascent stage ignites and climbs, spacecraft foil and dust flying in all directions. Ed Fendell in Houston anticipates exactly the timing of ignition, lift-off, and the rate of climb, and the camera tilts to follows the ascent. Awesome! And there apparently either wasn't any delay in the signal or NASA had the foresight to hire a remote camera operator who was able to see a few seconds into the future. Astronaut Charles Conrad, Jr, Skylab-2 commander, smiles happily for the camera after a hot bath in the shower in the crew quarters of the Orbital Workshop of the Skylab space station. The towel at the upper right corner hangs as on Earth, so there was no weightlessness and the photo was taken on Earth, not Earth orbit. The first photo of Earthrise by a human as he watched the event unfold (AS08-13-2329) was taken on 24 December 1968. 103:12:44 [Neil] Armstrong (Apollo 11): "I'd say the colour of the local surface is very comparable to that we observed from orbit at this Sun angle—about 10° Sun angle, or that nature." 103:22:30 Armstrong: "From the surface, we could not see any stars out the window; but out my overhead hatch (means the overhead rendezvous window), I'm looking at the Earth. It's big and bright and beautiful." [Alan] Bean, from the [Apollo 12] 1969 Technical Debrief—"Star (and) Earth visibility was interesting. We could always see stars at the upper rendezvous window." The Sun is currently 5.5° above the eastern horizon. With the Sun 10° above the horizon, stars should have been visible out the Apollo 11 overhead window too. [Neil] Armstrong (Apollo 11): "We were never able to see stars from the lunar surface or on the daylight side of the Moon by eye without looking through the optics." Alan Bean (Apollo 12): "Oh so carefully, I removed my silver pin, took one last look at it, and gave it my strongest underarm toss out towards Surveyor. I can still remember how it flashed in the bright sunlight then disappeared in the distance. It was the only star I ever saw up in the black sky, the sunlight was just too bright on the Moon's surface to see any of the others." Stars are not readily seen in the daylight lunar sky by either the human eye or a camera because of the brightness of the sunlight surface. 103:22:54 Duke: "...Gene Cernan says that, while standing in the shadow of the Apollo 17 [Lunar Module] (LM), he could see some stars while he was outside." (Correction on the star visibility issue from the Moon is introduced later.) Astronauts' reminiscences contradict the descriptions of the star sky observed by Soviet cosmonauts (Leonov, Lebedev, Savinykh) on the dayside of the orbit; light from the Earth (Earth albedo 0.367, Moon albedo 0.12) did not hamper them see the stars. For example, Leonov says that "the brightest of the stars can be recognised when they are farther than 30° away from the daylight luminary [the Sun]". On the Moon, the sky is black—even during the day—and the stars are always visible. In fact, the Moon is about the poorest reflector in the solar system... The Moon reflects only 7% of the sunlight that falls upon it. Omitted telltale astronauts' words from journal text? 116:07:19 [Alan] Bean (Apollo 12): "OK. You go ahead. That's difficult, because it's so tender up here on these legs." 116:07:26 [Charles] Conrad: "Well, I don't see the Earth anywhere in the sight." Listening to the RealVideo clip (1:39–1:45), Alan Bean actually said "It's difficult tricking them", and Charles Conrad replied "Yea, I know." 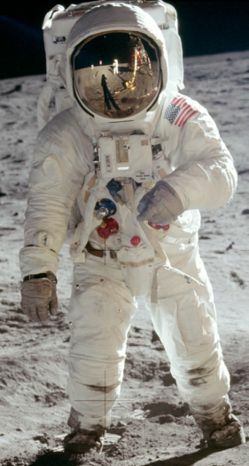 [Charles] Conrad (Apollo 12), from the 1969 Technical Debrief—"As soon as I got the vehicle stopped in horizontal velocity at 300 feet (figure 4–12 from the Apollo 12 Mission Report indicates that he stopped almost all of his forwards motion at about 220 ft), we picked up a tremendous amount of dust—much more than I had expected. It looked a lot worse than it did in the films I saw of Neil's landing. It seemed to me that we got the dust much higher than Neil indicated. It could be because we were in a hover, higher up, coming down...". According to the Apollo 12 land path, at 300 ft (90 m) the module was almost half a kilometre far from the landing place and was descending not vertically but down a very gently sloping trajectory, and dust was first seen at a 3 times less height of 30 m (100 ft). Fred Haise on the Moon? [Fred] Haise and fellow [Apollo 13] crewmen, James Lovell (spacecraft commander) and John Swigert (command module pilot), working closely with Houston ground controllers, converted their lunar module "Aquarius" into an effective lifeboat. Their emergency activation and operation of lunar module systems conserved both electrical power and water in sufficient supply to assure their safety and survival while in space and for the return to Earth. There are no signs of blowing the dust on the photo of the surface under the Apollo 14 lunar module. 03:42:29 [Apollo 17] Commander [Eugene Cernan]: "Separation, Houston." A Full Earth from the Apollo 17 Command Module at about 5 hours 6 minutes, shortly after separation of the docked CSM-LM from the S-IVB at 4 hours 45 minutes. When was the descent engine stopped? 113:01:43 [Harrison] Schmitt (Apollo 17): "Stand by. 25 feet, down at 2. Fuel's good. 20 feet. Going down at 2. 10 feet. 10 feet." 113:02:03 Schmitt: (Reading a checklist) "Stop, push. Engine stop; Engine Arm; Proceed; Command Override, Off; Mode Control, Att(itude) Hold; PGNS, Auto." 113:02:11 [Eugene] Cernan: "OK, Houston. The Challenger has landed!" Lunar rovers had an engine muffler? 120:11:01 [Harrison] Schmitt: "I do that (pause) in training, though." (Pause). 120:11:13 Cernan: "Ooh. (Grunting and breathing hard) Hey, Bob, just out of curiosity, what kind of heart rates has this drill been producing on me?" 120:10:57 Flight/EVA: "OK, we definitely did not want Flight to figure the rover's muffler at this point. He has it as a stick with mine as an optional, as an option, and ah we're, at this stage of the game, we're screwing around. We definitely do not want to figure this muffler. Since we're being called upon, I'm sure you all recognise not to do this anymore." Hook-and-loop fasteners, polytetrafluoroethylene non-stick coating, disposable nappies—here are only the most well-known results [of the Apollo programme] in everyday life. It has been counted that the spreading of "lunar" technologies gave the US economy an effect, estimated to more than $20bn. But the space technology created strictly for conquering of the Moon did not get further development. The Proton rocket and the Soyuz spacecraft which were both developed for circumlunar, not circumterrestrial flights. Why is the Saturn V no longer used? Notwithstanding the great carrying capacity, the Saturn [V] expendable launch systems did not get use—they got nothing to carry. The mass of even the most sophisticated artificial Earth satellites does not exceed 20 t. Yet another obstacle is the complexity and cost of service of the huge rocket. If we could build it from scratch in a few years in the 60's, and we already have all the plans, why not rebuild it now? Did they really have the load capacity NASA claims they had? The reason that the Saturn V was quietly forgotten was that it never preformed as stated... If NASA had attempted to correct the problems with the Saturn V it would have become apparent that the rocket could not have sent people to the Moon and that the Moon landings were faked. If the Saturn V carried the International Space Station (ISS) modules, which are now not heavier than 20 t, their mass could quadruple while their number be reduced four times, along with the number of the docking assemblies for space rendezvous, whose mass is now about one-seventh of the mass of the entire ISS. The number of the dangerous space rendezvous procedures would also be reduced. The cost of the two Proton rockets and one Space Shuttle used to carry three ISS modules is roughly equal to the cost of one Saturn V. And the ISS cost is thousands of times greater than the Saturn V service cost. Also, the launching cost for 1 kg of cargo using the Space Shuttle turns out to be much higher than using the Saturn V.(drawing 4) But for some reason, the Americans have money for the "prodigal" Shuttles and not for the "frugal" Saturns. And why is the F-1 engine no longer used but the US Atlas V rocket uses the Russian RD-180 engines instead that are nothing else but one half of the RD-170/171 engines of the Soviet Energia and Zenith rockets? The F-1 engine failure modes (especially combustion instability) need substantial research and the Russian RD-180 is recommended as a model for its modification, if it is to be used in future manned flights to the Moon and Mars. ↑ Wikipedia had an article devoted to the hoax "accusers". Two days after adding the above text about Pokrovsky's findings there on 23 July 2009, the entire article was proposed for deletion and deleted in a week. Meanwhile, Pokrovsky's business site was hacked and was empty in August–September 2009. ↑ Space lift propulsion, AeroJet-General Corp. This page was last modified on 21 April 2011, at 01:25.